Since it's the first day of fall I thought it would be appropriate for a fall post, even though I'm really not ready to let summer go. However, I happen love fall in the garden, I use the cooler temps for large projects I've planned and when I clean up I tend to really clean up. I always feel the more I clean in the fall, the better my gardens look in the spring & summer. That said I wanted to share a few of my fall landscaping tips, including cleaning up. My big project for the fall is a grass planting. When we bought our home 3 years ago I inherited some very large overgrown plantings, so I've decided to transplant all of the plants, and replace the planting with grass (for now anyway). Early fall can be time to plant grass, although it depends on which type of grass you are planting. I happen to be planting cool-season grass which grows best in temperatures between 60 and 80 degrees. The shorter days and cooler nights with heavy dews also create a perfect grass growing environment. I'm also doing some transplanting right now as part of a small garden path project I'm planning for the spring. Many people think it might be a little early for this, but not me. First of all, I like to see what I’m transplanting, if I wait and all of the foliage dies off I never feel like I do enough. Second, I think soil conditions are perfect right now. The soil cools at night and heats up during the day, which I think helps the transplants acclimate. I feel like transplanting later in the fall is had on plants as the soil stays relatively cold. If the foliage on your plants is looking tired cut them back. Remove spent stems & leaf, dead branches, etc…Removing these now will promote growth and overall health. Aerate your lawn. I skipped this last year, and it shows. If rain "pools" on your yard you know it's time to aerate. I usually do this twice once right now, and once later in the fall. Aerating now allows for the fall rains to get to your grasses roots, doing it in late fall allows melt off and spring rains to penetrate. Fertilize and/or overseed. Early fall is a great time to fertilize your lawn since grass roots stay active until the ground reaches 40 degrees. I use a specially formulated fertilizer for the northeast, but a high-phosphorus 12-25-12 mix will do the trick. If you’re not into fertilizing overseeding is a great way to boost lawn production. Both should be done after aeration. Collect leaves (but not all of them). The leaves have started to fall here in the Northeast so it's time to get them in the compost bin. However, leaving some of the leaves in your garden beds also a good idea. 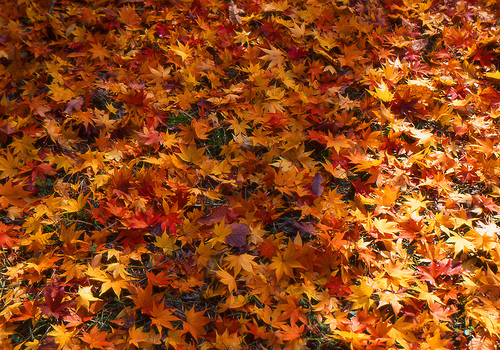 Be sure to turn your leaf pile, and try to break up the ones you leave in your beds as much as you can. Complete new plantings. As I said above I think early fall is a great time to get out and plant & transplant. I feel the cool nights and warm days of early fall really help plants to acclimate to their new digs. Trim trees & bushes. Full pruning is better done in late fall, but early fall is a great time to get rid of dead limbs. Later in fall you can prune to shape and promote growth. Mulch beds. Getting a fresh layer of mulch on your beds is a great idea. I use the previous years "black gold" (decomposed leaf), along with this year’s fallen leaves, and a double ground wood mulch. I try to get a fresh mulching down right after the first frost. Dig summer bulbs. I have taken a liking to growing Dahlias, and this year was the first year I've overwintered my Dahlia tubers. It's very easy to do (a post is coming), but let them blacken after the first frost and then come back to visit I should have a "how-to" post up by then. Divide plants. Again I think right now is a great time for this. I'm in the middle of digging and dividing hastas. Start checking out bulb catalogs, buy bulbs, plant bulbs. I'm starting to scope out bulb catalogs, but I tend to wait until they go on sale since they really shouldn’t be planted until after the first frost. So there you have it. A couple of projects and bunch of other work, but like I said the more you do now the better off you'll be. I feel like that should be the gardeners mantra "The more you do now, the better off you'll be". Kidding aside your gardens will appreciate the clean-up now, and trust me they'll reward you later. Also, doing projects now is much easier in the cooler weather, which gives you a better chance to get them done the way you want without rushing through. Enjoy your fall!! This entry was posted in Gardening Tips, Homeowner, Landscaping, Uncategorized and tagged Aeration, Bulb, Dahlia, Facebook features, Garden, Garden hose, Leaf, Mulch, Plant, Sowing, tuff guard hose. Bookmark the permalink.